I'm writing this post at the beginning of the day, so nothing can happen to spoil my mood before I can get it out there. 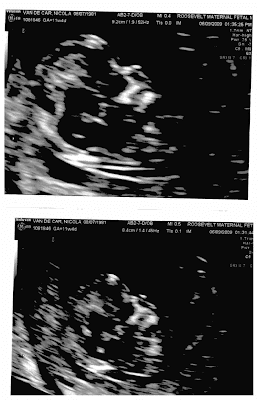 On Tuesday, I went in for my nuchal fold sonogram (tests for Downs Syndrome, among other things). I was a little nervous about it--truth be told, I've been a little nervous about everything, for months. I'm sure this is normal first-trimester behavior, but I'm a congenitally worried person to begin with, and so my anxieties have been, if not off the charts, way the heck up at the top of them. Let's just say that sleep has been difficult to obtain, while tears have been in surplus. They had a big tv set up so I could see everything. Roo was all squished up in a corner of my uterus, taking what looked like a little nap. The technician poked and prodded and tried to get a good look, while I watched with the same breathless befuddlement that I've always felt during ultrasounds--that's a baby? Really? How can you be so sure? The technician gave up and asked me to cough a few times, to see if I could wake the baby. I did, feeling a little silly. Roo woke up. Roo flipped over and started doing headstands, bouncing around and waving his little arms. And I felt a surge of one of the most powerful emotions I've ever experienced--everything was going to be okay. There was nothing wrong with this child--look at him! He was darling and I loved him,* in a way that was delightful, protective, and warm and friendly. It was the most overwhelming feeling, and I started to cry on the exam table--happy tears, this time. This, then, must be what y'all are talking about. I like it. And I like Roo. Here's a picture of the profile (somewhat worse for wear for having been scanned, but you can see...ish). Hard to believe that something so tiny is so far along already. Little feet! Little nose! Big forehead! *At that moment, he was a him. Other times Roo is a girl. I go with the flow. This is a *lovely* post, and Roo is darling. I can't believe you cried at WALL-E. I have lost all respect for you. You BETTER be blaming that on the hormones. Seriously, every time he (WALL-E) raised his "eyebrows," I crumbled. Since that is his only form of expression other than saying "EEE-VA," I was a blubbering mess. I think, for some reason, my ladder of empathy goes robot, animal (stuffed included), human, with humans as bottom rung. So not entirely hormonal.